We propose a different way to accompany your favorite dough with our Organic Romesco sauce with it gettin a tasty dish, juvenile and original. Put in a pot to boil water by adding a bay leaf, a little oil and salt. 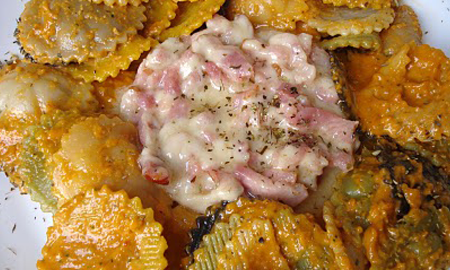 Boil pasta as it cooks and put the bacon in a pan without oil and fry-what, when starting to brown add the cream to reduce when it has reduced a bit add the cheese and you remove everything, then take it out and reserves. When you have boiled pasta and can drain and mix with romesco sauce, and serve everything put on a plate with the bacon and cheese that we have prepared.